MI Leggett’s label Official Rebrand debuted at DRØME’S New York Fashion Week show and will premiere their fall fashion film EAT with I’m Screaming at midnight this Halloween. Official Rebrand’s next collection, which will debut at Art Basel Miami, combines themes of fluidity and sustainability. I have always loved wearing costumes. At age three I exclusively wore Disney princess pajamas. Once I started reading, I donned round glasses and a Hogwarts robe. As I grew older and more receptive to society’s expectations for me, costumes dwindled from my daily dress. However I always looked forward to Halloween, when I could bask in the freedom to be someone totally different, a version of myself that was not constrained by social conditioning. I felt so stifled by the monotonous mandate of my catholic school's uniform, and there were so many things I wanted to be, that by the time Halloween arrived I would change costumes halfway through the day. All year I looked forward to dressing outside of the social norms around which I was learning to contextualize myself. Now, as a genderfluid artist and fashion designer, I recognize more completely the importance of that freedom. Unofficial uniforms can be more subtle yet just as restrictive as formal ones. 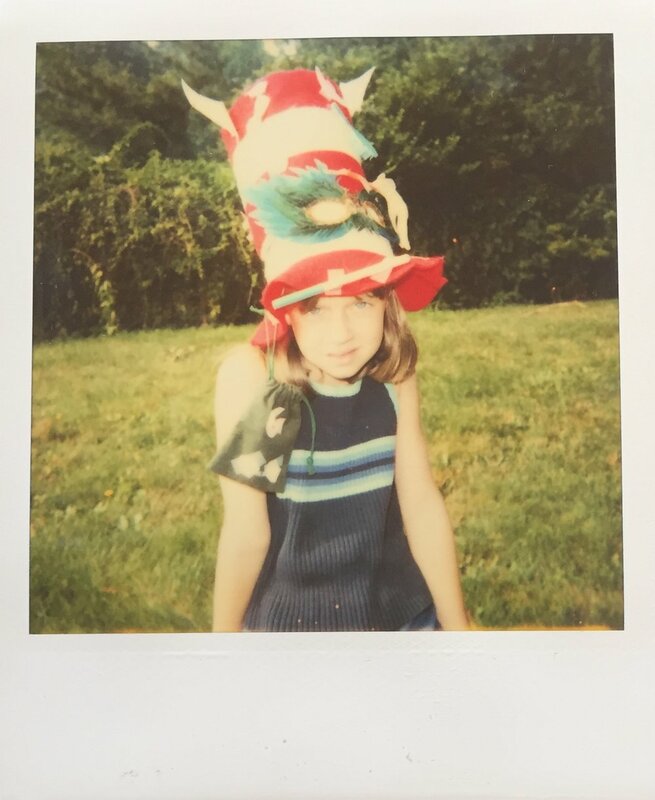 When I switched schools, I was overjoyed by my newfound freedom and wore such outlandish outfits to school that I was socially rejected. I felt constrained and limited to wearing clothes deemed appropriate for me by social norms, not by my own personal creative desire and taste. Adherence to appropriate trends was encouraged—experimentation was not. Still, in many contexts it is dangerous to resist such categories. Perceived deviation from social norms of self expression is often met with violence. People deserve the freedom to decide for themselves what feels right, uninhibited by societal dictations. Halloween reduces those limits and provides the option for people to be whoever or whatever they want. There is an expectation to dress up, to transform yourself, to try on being someone or something else. Although this might be daunting for some, for others this occasion provides a rare opportunity. As long as your costume does not offend, appropriate, or insult, the experimental freedom of Halloween can be a powerful tools of self discovery. For queers or anyone else who may not identify with inborn appearance, costumes can be more than just fun—they can be an important way to express and extend ourselves. Without the freedom to try new things, it is difficult to discover what is most comfortable. How can I know what I like until I try it? Just as no one should try to control my body, no one should control what I put on my body. For me, figuring out how I want to present myself is an endless process. Freedom to experiment with my personal presentation has been vital for me coming into my own gender queerness. I consider my identity to be fluid. I try new things, I change. Although my love for dressing up has remained, it manifests differently all the time. Last Halloween I was cigarettes; this year narcissism. Through my costume, I become these social phenomenon and better understand myself in relationship to them. Somedays I like to dress in a way that helps me imagine the boyhood I never had. I feel more connected to my felt self than my physical self. Clothing, be it an outfit or a costume, is a multifaceted tool. I use it to understand myself better, become closer to my felt self, and express my fluid interior identity. I can use clothes as a way to shape how I am perceived, eclipsing aspects of my physical self, namely my DFAB (designated female at birth) body. I love Halloween and the opportunity it provides for self-discovery. Experimenting through style should be an option for everyone, no matter the date.